Therefore a coach might explore cognitive dissonance to generate teacher growth. Here is an activity I recently designed to have teachers explore their beliefs regarding teacher expectations and their matching or mismatching behaviors. Place a long continuum on the wall with the numbers from 0-100%. Read the statements and ask teachers, “Where do you stand?”. Participants rise and physically take a stand. 50%- I can argue either side equally. Not sure how this impacts my teaching. 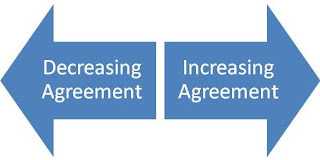 Other numbers illustrate varying degrees of agreement or disagreement. As teachers take a stand on each belief statement, facilitated discussion explores, “What teacher actions and behaviors are congruent with where you stand?”. As coaches work with individual teachers, PLC’s, teams, or departments they can continually return to this common experience and emerging cognitive dissonance. Steve – This is a great idea. I might modify it with a staff who is a little shy or not ready to take such a public “stand” and provide them with the continum at their table and they put a finger on the line, or maybe a dot as a collective team. Either way it starts the conversation and that is what initiates growth. I’m curious about the statements you have collected. Will you share those with us? Boo , thanks for comment.Some of the power of the activity is pushing the public stand. Activity really works with any beliefs/opinions you want to examine; What percent of a day should studnets be learning from peers or working in teams? What percent of your focus is on teaching life skills not listed as a componet of your curriculum?